Ready, set, vroom! Speedster ride-on toy cars for toddlers get their go from little drivers who power and maneuver each one. It’s fun for kids and also beautiful for grown-ups to look at. 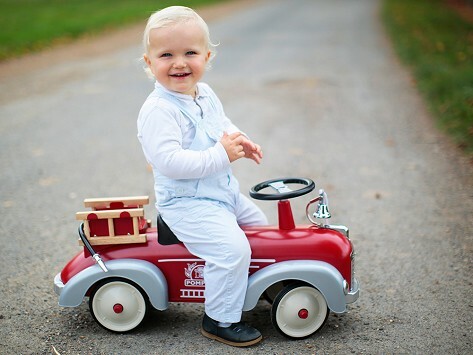 The sleek and sophisticated-looking ride-ons are designed in France and are inspired by models from the 1950’s, including a vintage fire truck. All have a durable metal body, rubber wheels, and functional steering wheel. But it’s the authentic, retro-inspired details that make these mini classic cars really shine. Gave this as a baby gift. The family absolutely loved it! They couldn’t wait to have a photo op session with baby onboard. Baghera founder Emmanuel Nouveau was inspired to make classic cars for the under-six set by his own childhood love of soapbox cars and the tin cars he saw in a Parisian toy store window as a kid. He fondly remembers picturing himself as a renowned racer. Drawing on Emmanuel’s appreciation for the sleek models of the 1930’s and 1950’s, Baghera’s ride-on and pedal cars give children the chance to experience a retro model in the most fun way. Authenticity is the key to these cars that kids can drive and steer themselves. Designed in France, the metal bodies and rubber wheels are not only accurate, they also make the cars durable for driveway races and front lawn cruises. And the vintage-inspired details and finish adds nostalgic charm that just might make grown-ups swoon.